Which strain should a new grower start with? You could choose to torture yourself by picking a brutally challenging strain like Sour Diesel, or you could pick a simple strain and learn the basics first. We recommend the latter, which is why we've compiled this list of five great strains for beginners. Are you looking to break into the world of growing, but don’t know where to start? When approaching your first, second, or even third harvest, you’ll need to pick up many skills: when to water, how to control for lighting, what fertilisers to use... As you juggle these variables, the last thing you want to deal with is a complex, finicky strain that’ll multiply the number of considerations. As a beginner, you want a simple, beginner strain. Any of the following five strains will be perfect for a grower just getting into the groove of things; once you master these, it won’t be long before you can handle the complexities of even the most challenging cultivars. If you’re a sativa lover, you can’t do better than Jack the Ripper, which combines the premium genetics of Jack Herer with ruderalis to produce autoflowering capabilities. If you’re looking for a top strain that’s easy to grow, you’ve come to the right place. Jack the Ripper flies from seed to harvest in 60–70 days and produces indoor yields of 300–350g/m². Outdoors, between 75–130g/plant is achievable. The plant grows to 60–90cm, remaining at a discreet height throughout its lifecycle. At over 20% THC, Jack the Ripper will bestow an almost overwhelming sense of joy, creative inspiration, and energy. Those unfamiliar with powerful sativas may become anxious or paranoid after too many tokes. A classic strain from the 1970s, Skunk combines genetics from Mexico, Afghanistan, and Colombia. Skunk is an ancestor of many celebrated modern hybrids, but the old girl has a lot to be proud of in her own right. Named for her characteristic “skunky” flavour, Skunk produces a high-energy, euphoric experience that can fuel either an artistic binge or a munchies fest. Skunk flowers over 55 days and reaches heights of 80–110cm. Yields are 550–600g/m² and 550–650g/plant for indoor and outdoor grows, respectively. Skunk is known for its reliability and hybrid vigour, producing plants that grow similarly each time, and are very forgiving. White Widow is a strain of balance—in her effects, flavour, and in her growing style. A 60% Brazilian sativa and 40% Indian indica, her effects are both joyful and relaxing, with a splash of that creative sativa energy. Her variously sweet and spicy aroma is surprising, but delightful. White Widow is a balanced grower known for her hardiness and reliability. As such, she is often recommended for first-timers. White Widow reaches heights of 150–200cm and flowers over a period of 60 days. 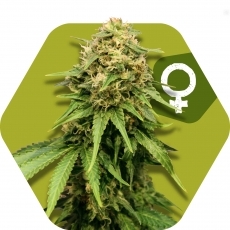 Her indoor yields are in the range of 550–600g/m², with 500–600g/plant possible outdoors. Power Plant XL has many qualities to boast about: a soaring, sativa-style high, massive yields, and fondness for beginner growers. Power Plant XL comes from South Africa and has become a favourite in coffeeshops throughout the Netherlands. She flowers quickly over 55 days and reaches varying heights of 80–200cm. Better still, Power Plant XL produces indoor yields of 600–750g/m² and outdoor yields of 500–600g/plant! As far as easy-growing sativas go, those numbers can’t be beat. Now for the moment all you indica lovers have been waiting for. If you’re looking for an indica-dominant strain for beginners, Critical XXL is for you. Critical XXL contains both Skunk and Afghani genetics, making her a strain of world-class quality that’s also easy to grow. At 19% THC, Critical XXL produces a fruity, pungent aroma that leads to a happy, relaxing, and creative voyage into the depths of consciousness. She flowers for 50 days and produces staggering yields of 650g/m² indoors and 600–750g/plant outdoors. She reaches heights of between 80–230cm depending on environment. Getting into growing for the first time can be exhilarating, exciting, and nerve-wracking. A key element is to choose a strain that’s suitable for beginners; and as we’ve seen, you can do so without making any sacrifice to quality or yields. Best of luck!